Paul Butler. Art ads installation view. Gallery 44, Toronto. Paul Butler is a Canadian artist involved in multidisciplinary, social and alternative pedagogical practices. He hosts The Collage Party— a touring experimental studio; directs The Other Gallery in Toronto; runs theuppertradingpost.com a website that facilitates artist trading, and writes about artist-run culture. His curatorial projects have included works by Matthew Higgs, Mitzi Pederson, Harrell Fletcher and Guy Maddin. Butler has exhibited at the Museum of Contemporary Art, Los Angeles; Justina M. Barnicke Gallery, Hart House, University of Toronto; White Columns, New York City; Creative Growth Art Center, Oakland, CA, USA; Sparwasser HQ, Berlin and Gallery 44, Toronto. Paul Butler art: Untitled 1, (2010). 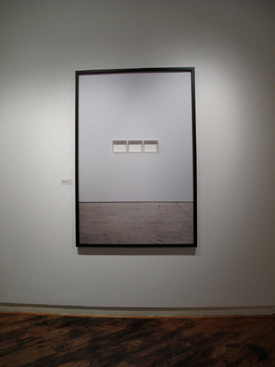 Gallery Intervention Series, installation view. Cut-out archival digital inkjet prints dry-mounted to plexiglass. 4’ x 6’, Ed 1/1. As I listened to the calm, boyishly attractive Paul Butler at his Toronto Art ads opening, it was clear that he prefers discussing art to self promotion. A constructive art dissident, Butler explores art and artist-run culture in a variety of wildly imaginative ways. Butler’s 10 foot by 6 foot prints, all lines and angles in luscious, monochrome greys and whites drew in viewers who then stayed on for his lecture. Echoing Robert Rauschenberg’s cut out space in Gloria (1956) Butler’s prints illuminate and humour. A few weeks later I caught up with Butler (who happens to be a cousin of my husband) by telephone in Winnipeg. Sarah Giddens: With Art ads, you don’t appear to be going after art world advertisements directly, but something more conceptual, perhaps the artwork as an advertisement in itself. Could you clarify your intention? 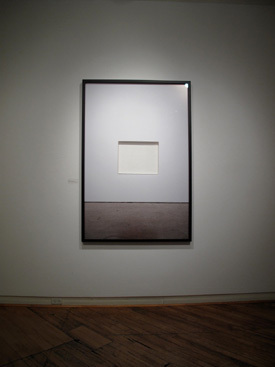 Paul Butler: These works are titled Untitled 1 -4, from my gallery intervention series. They stem from an ongoing art ad series I’ve been working on since 1997 where I make art from the art world’s ephemera and advertising. With Gallery Interventions, I’m hoping to spark a discourse surrounding alternative exhibition spaces by taking the “art” out of the “gallery”. Sarah Giddens: At the Art ads opening, some viewers walked up to your 10 x 6 foot prints only to exclaim or laugh and step back as if bitten by a snake. What kind of responses were you imagining? Paul Butler: Ha! I wasn’t thinking about responses when I created this series. I’ve been dreaming up Art ads for over a decade now, so I guess I’d be surprised by such an emotional response. Paul Butler art: Untitled 3 (2010). 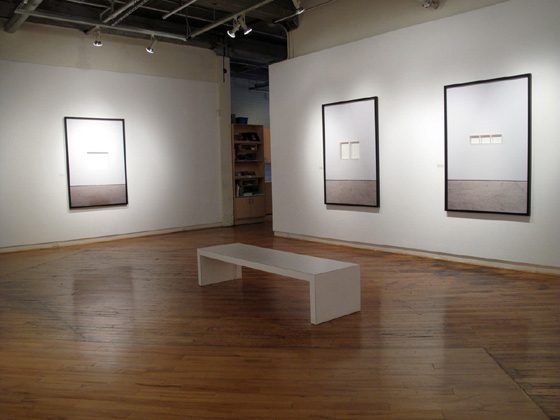 Gallery Intervention Series, installation view. Cut-out archival digital inkjet prints dry-mounted to plexiglass. 105 x 156 cm. Ed. 1/1. Sarah Giddens: Art ads exploits the viewer by removing “art” from the print thus raising cheeky but serious questions about the role of the art world. You have been making social commentary through art for some time now; can you explain how your artistic process has evolved? Drawing was my first love, then to collage to art ads to multi-disciplinary. Drawing a stranger, an early show, was collage but the gallery presented it as a “new form of drawing.” In Art ads, a critic referred to the cutting out of images as me, the artist drawing a line, cutting a line with a razor. It always goes back to drawing. These days I think about the outcome first, and then consider an appropriate medium... so the medium comes second now. And if I need to farm it out— right now I’m doing some aluminum works that are being painted in an auto body shop— I do. Sarah Giddens: What would the young Paul Butler have made of your current show? Paul Butler: Fifteen years ago, I probably would have said something under my breath like “what a jerk” and walked away! Back then I needed an immediate response; I hadn’t developed the ability to read and explore pieces or to fully consider context. Fifteen years on I’ve been a gallery board member, run a not-for-profit artist’s commercial gallery and now I can pull all of those experiences into my art practice. Sarah Giddens: Your artistic influences? Paul Butler: It switches all the time but the Italian artist Maurizio Cattelan (La Nona Ora) comes to mind— he’s hilarious. For a while I was looking outside of the art world at music, biography. I love a confessional autobiographical singer songwriter— Lucinda Williams, Dylan, Bill Callahan, and I think I am finally falling into the massive ocean of jazz. Sarah Giddens: Some of your previous works have involved iconic Canadian images such as the canoe and Sasquatch. You are from the Prairies, you’ve moved to Toronto and toured Europe and the USA. Can you talk about some of the ways that being Canadian informs your artistic sensibilities? Paul Butler: Coming from Winnipeg, the middle of Canada, I’ve always had a sense of space and big sky. Sometimes I feel we may be a bit handicapped or less driven than other countries, but on the positive side we are more considerate of other things beside ourselves. Canadian art does get attention internationally but not as much as it deserves... maybe our time is still coming. Sarah Giddens: Have you ever done any art paring with First Nations or Inuit? Paul Butler: There’s an exchange project I’ve been working on for a few years with two artist’s communities and The National Gallery of Canada. It’s an artist’s exchange between Cape Dorset, Nunavut (an Inuit community) and Winnipeg. It bothers me that there is such a disconnect between these polar ends of Canada. Cape Dorset has a really amazing international reputation for the art that they produce but their relationship to the rest of Canada is dysfunctional. I want to extend an olive branch with this exchange. We’ll go up there and use drawing as our common language. We’ll sit and draw and make prints and share our stories, it’ll be a really subtle and quiet conversation. Later Cape Dorset artists will come south to Winnipeg to continue that conversation. The entire collection would form a publication followed by an exhibition of all the prints and drawings we’ve made. Historically, Inuit had their relationship to art changed drastically when they were forcibly displaced; this project is an attempt to repair that relationship by putting art at the center of the discussion. The exchange is a huge undertaking, we’ve been working on the logistics for three years now, and since it is a once in a lifetime opportunity, we need to go slowly to get it right. Sarah Giddens: Were you this socially aware when you started out in art? Paul Butler: Honestly, I think it’s coming from Winnipeg; it’s a big part of our identity or character. For a while I got disillusioned by the commercial art world-– to the point where I wanted to hang up my hat. I felt disgusted by the ways that artists were making art for the wrong reasons. I thought if I can’t do something that feels meaningful to me with art then I don’t want to do it anymore. Slowly began to see that I could find my way in art, this shift happened in the last ten years and I learned much from running theothergallery.com. For example, I’ve seen that artists themselves aren’t really welcome at art fairs and I’ve been able to develop meaningful relationships with artists. I never intended to open the damn thing but the art pulls me in every time. Sarah Giddens: You are an artist, a collage party host, a curator, and a reverse pedagogy disciple. Can you tell me something about your current role in mentoring emerging artists? Paul Butler: Hah! We still don’t know what reverse pedagogy is! I try to make myself available to emerging artists and I’ve been mentoring a talented young artist from the University of Manitoba for about three years now. I also go to speak at art schools now and then. I remember how eager I was starting out, I would hang out at the local gallery and offer to paint their walls just to be around, right? So I try to give young artists all the access I take for granted. Sarah Giddens: In 2008 at your Interventions exhibition you said, “And now, with the current financial crisis, we have an exciting opportunity as artists, to reclaim control and reinvent our art world, despite the art market." How has that mood of optimism changed over the past few years? Paul Butler: How’s that working out? [Laughs.] It is sort of early to tell, things have hit Canada a bit slower. Ultimately, it’s the artist house and we should play a part in defining it. I don’t know what has been sprouting up in New York or L.A. and I think Detroit would be an interesting place to investigate. I hear there are a lot of amazing things going on there and with the ridiculously affordable studio space it seems everyone has left but the artists. I know that whatever happens financially there will always be artists— those who make art for the market and those who make art for themselves hoping that the market will accept them. Sarah Giddens: Have you any experiences of business and art partnering in a truly wholesome way? Paul Butler: Yeah, Red Bull, an energy drink supports a gallery in Toronto. I guess they took on artists globally as a new market, you know, artists stay up all night. They hired a great curator and did not interfere— it’s become a respected program. When government money for the arts is threatened, artists have to look for support; some businesses seem able to put money into art without inserting agenda. Like Scotia Bank’s support for Toronto’s nuit blanche. It helps keep art alive and uncompromised, if somebody wants to pay for uncompromised art then who cares who pays for it? As long as it’s not dirty money! Sarah Giddens: What are you currently working on? Paul Butler: The Greg Curnoe bike project. Curnoe was, in my opinion, an overlooked artist. A pioneer in artist-run culture, Curnoe started CARFAC and an art magazine. He was a nationalist in that he refused to go across the border to seek fame. He’d never call himself an activist but he was. As a cycling enthusiast, Curnoe used his bike as a theme for much of his art. About five years ago I was talking with the designer Craig Allen Smith, we agreed that the difference between design and art was function so he would design something without function and I would make art with function. A bike— Greg Curnoe’s bike. I was always into bikes growing up, the BMX in particular. I talked to some of Curnoe’s contemporaries and people caught on and started sending me names and I got the blessing to go ahead with the project. With Curnoe’s former bike builder we are making three bikes— one for a gallery, one for a collector and one for me. In addition, I’ll be running a research exhibition at the Art Gallery of Ontario (AGO) looking at Curnoe’s research diaries and journals on artist-run culture from 35 years ago and what is it now. I’ll use the bike as a vehicle for this project and organize cycling events. A documentary is being made about the whole project. I’m really trying to take more time on my own practice and am working with a few commercial galleries. [Laughs.] I am an emerging mid-career artist.